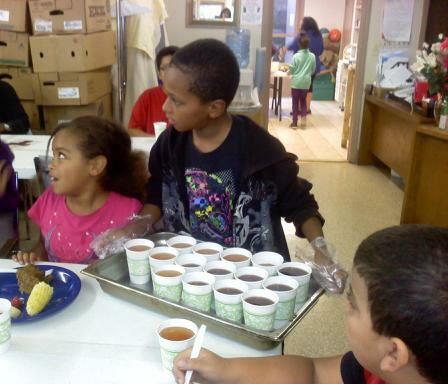 The City of Newburgh’s desperate need to keep the “Children’s Summer Lunch Program” afloat caused Northeast Gateway to Freedom in Newburgh, New York, to step up and meet the challenge of summer in 2010. 135 volunteers from all walks of life jumped in to offer their help. The collaborative effort of volunteers and contributors was very moving. With heartfelt care, we were able to prepare and deliver 600 lunches each day, totaling 30,000 lunches to our city’s children throughout the summer. An application was hand delivered and 103 KIDZ signed up the first day. 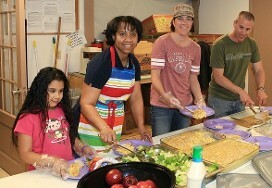 Thus began our “KIDZ INITIATIVE” after school dinner & Life Center, which is in its third year. We continue to take applicants and build a strong infrastructure to meet the challenges KIDZ face. We are committed for the long haul as we move forward in manageable increments. All of our efforts are to provide a safe and exciting environment for KIDZ and prevent illegal juvenile behavior. In the summer of 2011, we launched Phase III, a fast paced, active, summer KIDZ Initiative. During that time, we interviewed troubled 14-21 year olds. This led to Phase IV. Realizing older KIDZ need to meet challenges as well, we help 14-21 year olds step up to their potential. In turn they encourage younger youth to step up with them, giving them a safe place to speak with community leaders that care about their future. We believe that a child who discovers their purpose and destiny is more likely to make better choices and become an upstanding citizen. We also believe that KIDZ who are kept active are not as prone to criminal behavior.